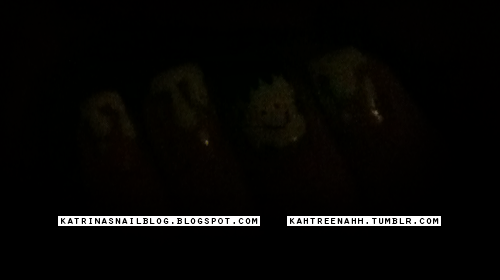 For the the base of Frankenstein & for the drips, I used OPI's Who The Shrek Are You? (you can still see the Shrek-color green around the edges of the drips) and then I painted Serum No 5's Day Glow over it. I previously swatched Day Glow here if you want to check it out. 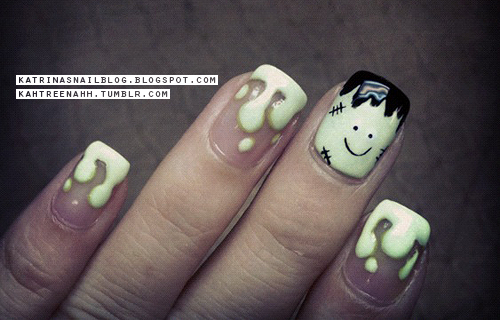 For Frankenstein, I free-handed the details with a black nail polish. Another picture, obviously not color accurate, but I really like it. I posted this on instagram (@kahtreenahh) yesterday after I finished the mani. Really really cute! I think I'm going to try this on my daughters for Halloween! 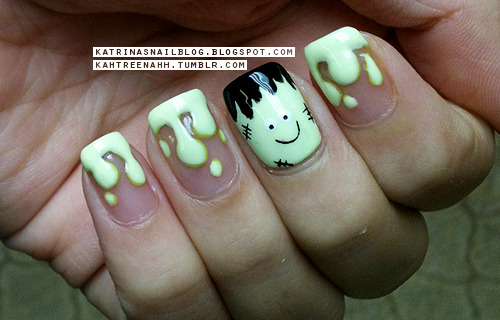 That's the cutest Frankenstein I've ever seen! Hihi. This is super cute!! The layering of the darker color under the drips makes them look 3-D. I think if I do drip nails, I'll add shadows in because of the cool effect your mani has going on! Omg I'm so in love with this mani!!! Very nice job!